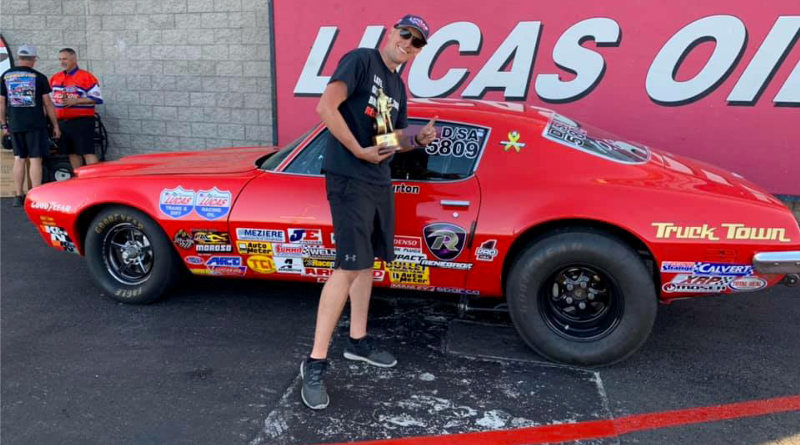 Brad Burton and Tony Mandella led the list of winners at the NHRA Lucas Oil Drag Racing Series Pacific Division at The Strip at Las Vegas Motor Speedway. Tony Mandella, Eastvale, Calif., ’92 Camaro, A/SMA, 8.077, 165.60 def. Doug Lambeck, Irvine, Calif., ’08 Sunfire, D/SMA, 8.455, 158.07. Larry Zavala, Montebello, Calif., ’87 Camaro, SS/IA, 10.004, 126.58 def. Dave Kelly, Walla Walla, Wash., ’98 Firebird, SS/JA, 10.330, 126.54. Brad Burton, Snohomish, Wash., ’72 Firebird, D/SA, 10.810, 117.39 def. Jimmy DeFrank, Thousand Oaks, Calif., ’69 Camaro, AA/SA, 10.038, 129.85. Michael Dalrymple, Sunnyside, Wash., dragster, 9.054, 175.59 def. Brian Preszler, Kennewick, Wash., dragster, 9.064, 177.07. Craig Maddox, Sidney, Neb., ’07 Prowler, 10.037, 162.94 def. Ken Mostowich, Calgary, Alb., ’13 Corvette, foul. John Dexter, Surprise, Ariz., ’68 Camaro, 11.078, 140.59 def. Harlan Tucker, Miranda, Calif., ’91 Daytona, 10.971, 134.32. Richard Okerman, Torrance, Calif., ’89 Beretta, 7.363, 162.39 def. Sammy Gonzales, Albuquerque, N.M., ’02 Grand Am, 11.675, 94.44. Steve Casner, Sheridan, Calif., dragster, 6.836, 199.11 def. Brianna Wiens, Las Vegas, Nev., dragster, 6.765, 202.12. Rick Newport, Bluffdale, Utah, ’95 GSXR, 8.210, 156.88 def. Sean Conner, Boulder City, Nev., ’95 Suzuki, 8.652, 151.12. Kenny Snow, La Habra, Calif., ’69 Chevelle, 11.058, 137.06 def. Ryan Giacone, Glendale, Ariz., ’88 Thunderbird, 11.080, 149.58.